Going for that "oldtime postcard" look again in downtown Huron. Very cool treatment on this image! Definitely succeeded in giving it an oldtime postcard look. Actual HDR or is it just processed with a tone-mapped look? Three shot HDR run through Photomatix software. Nice. 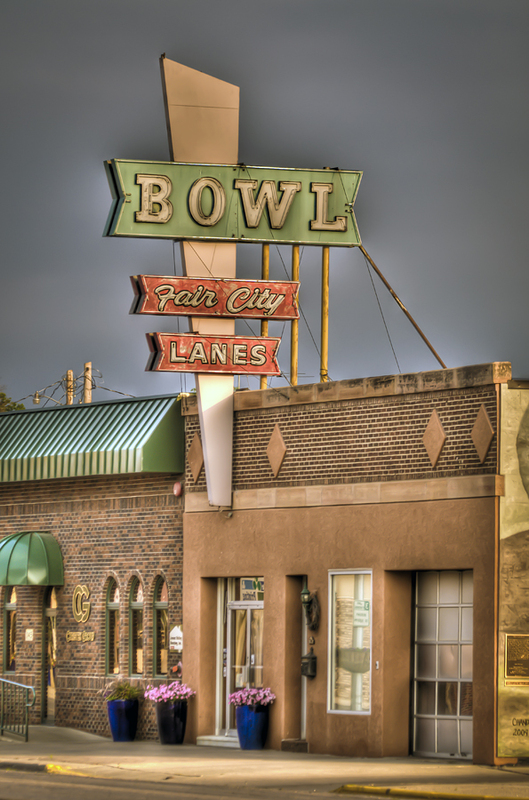 Not sure if you used the burn tool to deal with ghosting around the sign, or if that's the way Photomatix processed it. Looks interesting and very cool though. Not only is ghosting minimized but there's also some nice drama in the sky. That's totally Photomatix doing that glowing ghosting thing. Depending on the way the sky is to begin with, it can do some fun things or some really ugly things. Yeah, I've yet to find any HDR software that can always be trusted with skies. I usually have to spend extra time dodging and burning to even them out. Anyway, I'm really enjoying looking at your work - great stuff! Thanks for sharing it.